A Pintura Holandesa (Dutch Painting)de Seymour Slive. História da Arte (History of Art) de H.W. Janson e A.F. Janson. “O Espelho da Natureza. Holanda, século XVII” emA História da Arte (The Story of Art) de E.H. Gombrich. “A Pintura nos Países Baixos”em Filosofia da Arte(Philosophie de l’Art) de Hippolyte Taine. “The Dutch attain ‘The perfection of professional art” em Art: A New History de Paul Johnson. Mestres do Século de Ouro da Pintura Holandesa, catálogo da exposição realizada pela Pinacoteca do Estado de São Paulo (1998). “A Renascença Setentrional” e “Uma visão protestante holandesa” em A História da Pintura de Wendy Beckett. A Pintura Holandesa (Altniederlandische Malerei im 15) de János Végh. The Art of Describing: Dutch Art in the Seventeenth Centuryde Svetlana Alpers. Dutch Seventeenth-Century Genre Painting de Wayne Franits. A Brief Overview of the Dutch Art Market in the 17thCentury em essentialvermeer.com. Peinture et société dans les Pays-Bas du XVIIe. siècle de Jean Lombard. Dutch Painting de R.H. Fuchs. L’Âge d’Or hollandaise – de Rembrandt à Vermeer avec les trésors du Rijksmuseum de R. Priem, M. Restellini e P. Sigmond. Enchanting the Eye, Dutch Paintings of the Golden Agede Lloyd Christopher. The Dutch School de Neil MacLaren. Rembrandt versus Vermeer: The Titans of Dutch Painting, debate entre Simon Schama e Tracy Chevalier para a série Intelligence Squared. Painters, Guilds and the Art Market during the Dutch Golden Agede Prak Maarten. The Dutch Republic: Its Rise, Greatness, and Fall 1477-1806de Jonathan Israel para a série Oxford History of Early Modern Europe. Bruegel to Rubens, Masters of Flemish Paintingde S.-T. Desmond e J. Scott. The Group Portraiture of Holland de Alois Riegl. The Golden Age: Dutch Painters of the Seventeenth Century de Bob Haak. Rembrandt’s Eyes; The Embarrassment of Riches: An Interpretation of Dutch Culture in the Golden Age;e “Rembrandt” em O poder da Arte de Simon Schama. 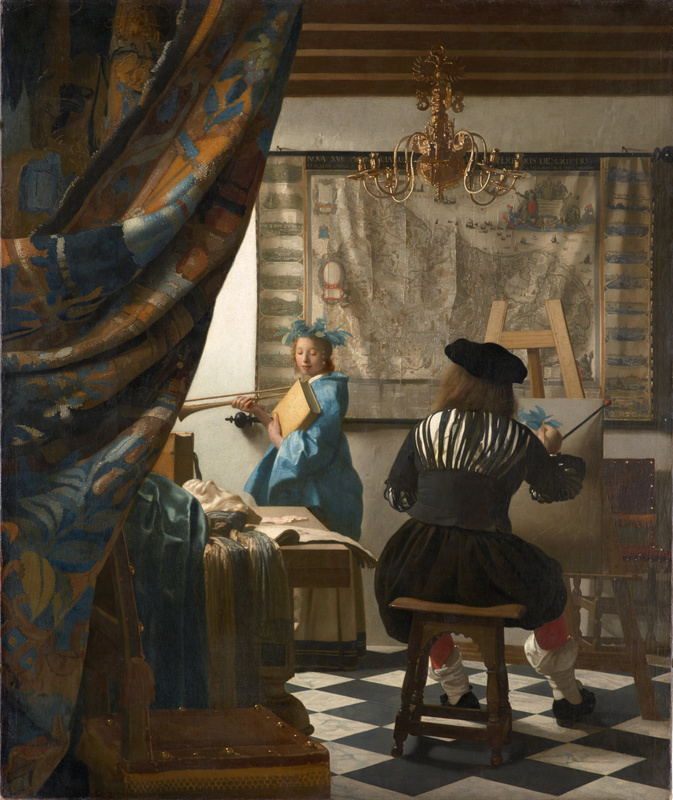 Vermeer e The Encyclopedia of Visual Arts editado por Lawrence Gowing. Early Netherlandish Painting de Erwin Panofsky. Dutch Painting de Christopher Brown. Painting in the Dutch Golden Age de C. Brenner, J. Riddel e B. Moore.